This spring I read A Life in Balance, a most intriguing book produced by a company called Learning Breakthrough Program. This is a book for parents, whether they homeschool their children or not. This paperback book was written by Frank Belgau as told to his son, Eric Belgau. It is the story of how Frank Belgau, an Air Force Flyboy and mechanic turned special education teacher and researcher, created the Learning Breakthrough Program, which helps children overcome their learning differences. It is a pleasant and easy reading – 200 pages long. It costs $16.95. It is also an interesting account of what Houston and the space-program was like in the 1960s. Finally, it is a riveting account of how the brain works and, in particular, how the vestibular system affects our physical mental processes. If you are looking for an ADHD alternative treatment or for a dyslexia treatment, you need to read this book. If you simply want to improve your child’s (or your own) reading, you need to read this book. If you are a professional trying to keep up with an increasingly demanding workplace, you need to read this book. The suggestions will help your brain stay focused and sharp. Last but not least, if you have Baby Boomers in your life who want to continue to stay sharp, you need to tell them about this book. 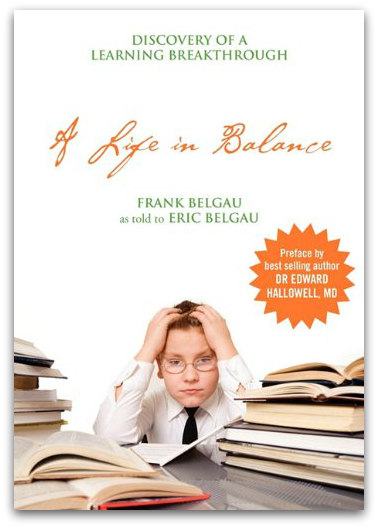 Brain training and brain fitness suggestions abound in A Life In Balance. Have you ever noticed how your toddler toddles? Have you ever noticed children walk differently? Some walk smoothly, freely swinging the arms, with an erect posture, and in a rhythmic fashion. Others suppress their arms and their feet do not move smoothly. They seem to lose their balance after a few steps. Many are somewhere between these two extreme points. Frank Belgau discovered the connection between the physical ability to walk straight and the cognitive ability to read in a very personal way. You see, Frank Belgau could not learn to read himself until he was in fifth grade. As such, he developed a strong empathy for “unteachable children.” He felt the shame of being the only child in his family who could not read. He also lost his lunch to a bully. But the bully did not want his lunch or his lunch money. The bully simply wanted to find somebody weaker than he, to beat up on and make himself feel better. Frank tripped over his own feet after a few yards – consistently. Physically, he was a mess. The bully only made it worse. As a fourth grader, Frank accepted the fact that he could never be as smart and accomplished in school as his siblings. But to not be an athlete and to receive daily beatings from a bully pushed him to come up with a plan. He spent the summer between his fourth and fifth grade running on the beach, aiming his feet at fiddler crab holes, like a football player doing a tire run at training camp. At first, he tripped often and tumbled face down. As the summer wore on, he got better. His speed picked up. He could aim and not miss these holes. When he went back to school, he put the bully in his place. They even became best friends. But he discovered his summer set of exercises brought about another benefit: he could read. Just like that. By running and organizing his physical balance, Frank organized his brain. Once he was honorably discharged from the Air Force, he became a teacher and, then, a special education teacher. From one school system to another, from one university research lab to another, he perfected the Balance Board and a set of exercises which help children organize their brain so they can learn. The largest industry in the United States is the prison system. All the inmates in our prison system have some sort of learning disability or difference. These people are not stupid. Many of them are quite intelligent. But they are frustrated. They could never learn as easily as their peers. Sitting at a school desk feeling stupid and useless and inferior lead them to frustration. So they act out. And the downward spiral commences. The book contains a preface written by Dr. Edward Hallowell, MD – a Harvard professor – who strongly believes in and supports the Learning Breakthrough principles. However, there have been many in Academia who gave Frank Belgau a hard time through the forty years of his research and experiments. You can hear the sadness and frustration in Frank’s “voice” about that as you read the book. Personally, I think the book could use some editing to eliminate repetition and numerous typos. But, overall, this book will give you an alternative way to deal with learning differences. I have always believed that physical exercise impacts the brain tremendously and modern research supports that premise. I saw ADHD being reversed through an education which involved similar principles when I worked for a special education residential treatment program. This book lines up even more arguments in support of such alternative programs and stepping away from medication. The Space Walk – a series of exercises that will give you observable results in improving reading – is outlined in the back of the book. All these activities are described in length in the Appendix of the book, which would give you a clear way of experiencing the benefits of the Learning Breakthrough Program before deciding about purchasing the Balance Board.